In September 1985, under the leadership of India’s youngest prime minister Rajiv Gandhi, India first got its own Ministry of Environment and Forests. This year the ministry has proudly completed 25 years in the service of protecting and preserving the environment of the country. The interest and vision was shared by his mother, the first lady prime minister of the country. Mrs. Indira Gandhi had brought out the country’s first Wildlife Protection Act in 1972. And she had launched the first Tiger Project in 1973. Good leadership has, over the ages and across the globe, driven big and successful initiatives for human welfare and brought the world closer. Our country too has witnessed many such great leaders and lived through the beautiful minds of many legends, indeed one among whom was Mahatma Gandhi. Today, the sustainability challenge is even more complex with rising temperature and debates over climate change. Nations around the world are struggling to evaluate and come up with means to combat climate change and yet develop at the desired rate. India too is running the race towards sustainable development and the various ministries are working hard to find a narrow way out of the crunching demands and needs for development at one hand and environmental protection on the other. Recently the leaders of our country have been throwing different ideas and political agendas at each other while maintaining their calm over several disputes. Congress party president Sonia Gandhi declared her emphasis and priorities more towards the protection of the environment. She went on record stating, “At the same time, we must protect the environment to ensure sustainable development. In whatever we do we must not forget that our lush forests and mountains, majestic rivers and all other water sources, and clean air have sustained and nurtured us for millennia. We have a responsibility to preserve them for the coming generations.”. 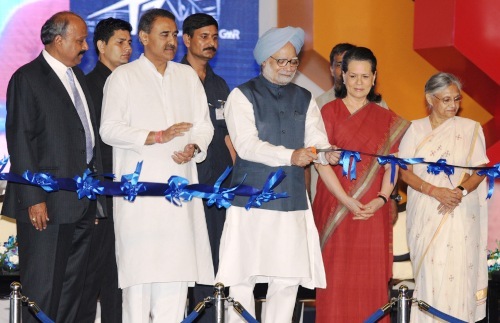 While admitting that economic growth is built on greater electricity production and consumption, Mrs. Gandhi clarified her stand during the dedication of the national capital thermal power project in Dadri, Uttar Pradesh. At the same time, her party member and the present Prime Minister of India Dr. Manmohan Singh, reportedly told media persons during a recent interview, “Environment issues are very important, but at the same time if anyone believes that environment can be protected by perpetuating poverty in this country, that is a view I do not share.” Dr. Singh is previously known to have carried out economic reforms in India during his tenure as the Finance Minister from 1991 to 1996. It was a big boost to Indian economy and these reforms resulted in the end of the Licence Raj system, helping to open the Indian economy to greater international trade and investment. Clearly his stint as the Financial Minister earlier gave him more wisdom and confidence to make such statement on environment, versus the development issue in the country. It was clearly an economist and not the Prime Minister of the world’s largest democracy who instructed the Supreme Court to lay off policy issues when the latter ordered the Ministry of Agriculture to distribute food grains to the poor instead of letting them rot. Union Minister of Environment & Forests Jairam Ramesh has been under the UPA government scanner and been grilled over issues of his Ministry blocking the way of ‘development’ programmes and projects in different parts of the country, most recently in Mumbai and Orissa. The tension has mount up so high that some people have come to term him as the “most endangered minister in the ruling government”. He comes in the media limelight often for his stern stand especially against compromising the environment over developmental works or projects that defy the principles of sustainability. Another Gandhi in the political arena, riding high on protecting the environment, and more so through protection of tribals who inhabit large areas of forests is Rahul Gandhi. He recently visited the tribals in Niyamgiri, Orissa and assured them that no one will tamper with either their mountains or their land. Supported by the young leader over the Vedanta case in Orissa, Mr. Jairam is moving ahead with his die-hard policy to save the environment. On the issue of the new airport construction in Mumbai, Mr Jairam said that if the Maharashtra Government and the Union Civil Aviation Ministry want Mumbai’s second airport to come up at the proposed site in Navi Mumbai, they should use some of the land allotted to Mukesh Ambani of Reliance Industries for the Special Economic Zone (SEZ). And the mangroves should not be destroyed on the northern side, as will be the consequence of the present construction proposal. The greatest challenge of sustainable development is ensuring the involvement of people in the making of decisions that impact them directly. And clearly the ruling party has already taken a step towards achieving it. In a clear message to party workers elsewhere, Sonia Gandhi stated that campaigns should be taken up against illegal activities affecting the environment and livelihood of the rural masses. She hailed the party’s earlier campaign in Karnataka against illegal mining in Bellary by the Reddy brothers of the BJP. Its undoubtedly an era of green movements standing high against the conventional “development” mindset which is usually not inclusive. We hope that true leaders with a vision for the country’s long term prosperity and sustainability win the clash and set ahead in the race to becoming green titans! Wow I must cnfoses you make some very trenchant points.